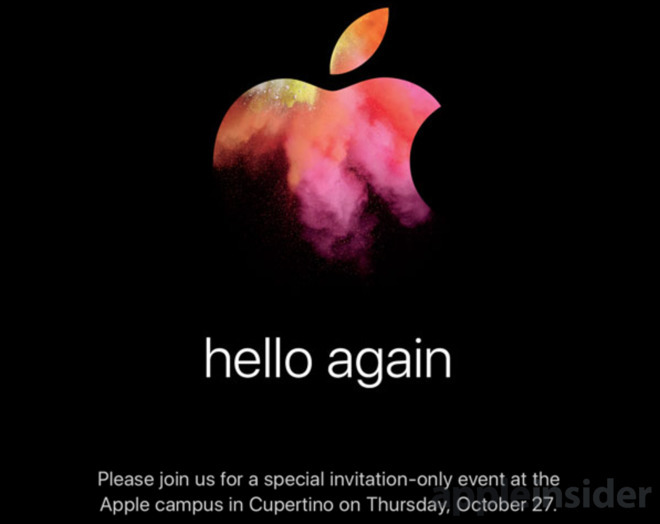 The color-splashed invite sent out to the press on Wednesday for the forthcoming Oct. 27 Apple release event uses language that Apple has used before in two other groundbreaking product debuts. 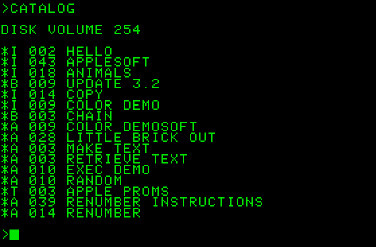 "Hello" as a computing term has been in use by Apple since the original Apple II. On Apple DOS 3.1 dating back to 1978, the "hello" program, if present, would be automatically launched on boot allowing for rudimentary program selectors if there was more than one title on the disk, or to start the launch sequence of a single title on the disk. 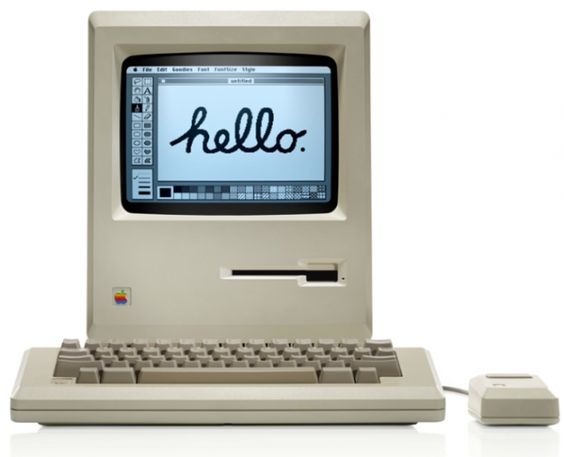 More relevant to the event, is the use of a cursive "hello" on the screen of the Macintosh 128k model in early marketing materials dating to 1984 for the computer. Upon Steve Jobs' return to Apple in 1997, the company immediately started rolling back what was considered failures at the time, including the wide commercial availability of the Performa line, and the execution of the Newton. In the beginning of 1998, the company returned to profit. A few days later, Jobs' return was further cemented by the announcement of the original iMac, and the second G3 Powerbook that Apple produced, the "Wallstreet" G3. Both products returned to promises made to consumers about the Macintosh line in the early days. With the "there is no step three" iMac, came marketing materials recalling the original Macintosh release. 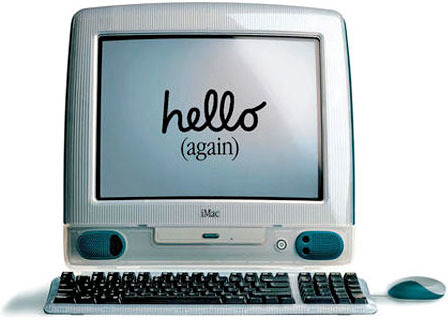 Each time Apple has used "hello" in marketing materials, it has heralded a seismic shift in Apple's personal computing focus. What's with the color splash in the Apple logo? Apple generally doesn't dole out much in the way of "red herrings" in pre-event marketing materials, even if they aren't immediately identifiable before the announcement. So, the splash probably means something, even if what that is, isn't immediately apparent. The most likely reason for it is a return to colors other than white, black, and default aluminum gray in Apple's product line, banished from the line at the end of the G3 iMac's day in the sun. Shifting over finish techniques mostly perfected for the iPhone to the Mac is an obvious choice. The most recent Mac to be updated is the MacBook, which is the only one to be upgraded in 2016. Most of Apple's Mac line has lain fallow for over a year at this point. Rumors have already pegged a new MacBook Pro for the event, with recent reports claiming that the MacBook Air will survive, but only in 13-inch form. The 4K 21.5-inch iMac, and 5k iMacs were the last computers updated before the MacBook by Apple, but even that was at about this time last year. The less said about the time since the last update to the Mac Pro, the better. While a refresh of the line is possible, and we're holding out hope, we're not expecting a return of the line at this time. The Mac mini was last updated in October 2014, and is regarded by long-time users as a step backwards from earlier (upgradeable) models. We don't expect Apple will return to an upgradeable Mac mini if it is upgraded at all, as we feel that Apple considers it and the MacBook to be "bridge" computers for the iOS user, rather than aimed at the Mac tinkerer. Apple's main focus, and prime money maker for five years has been the iOS ecosystem, and that can't be denied. Users haven't suffered in the drought as much as they may have in other years, as the CPU offerings by Intel have not benefitted speed-wide proportionately as mobile counterparts by other vendors have. For now, Apple has a vested interest in keeping the Mac line at least relatively current, if for no other reason than to drive iOS. Xcode remains the iOS development platform, and until Apple develops it for other platforms beyond just test beds or educational tools, Apple fans need not fret that the computer is totally abandoned in the Cupertino halls. That said, new Macs utilizing better GPU technology whether integrated or discrete that include some of the new technologies like Thunderbolt 3 and USB 3.1 Gen 2, are welcome, even for us non-coders.